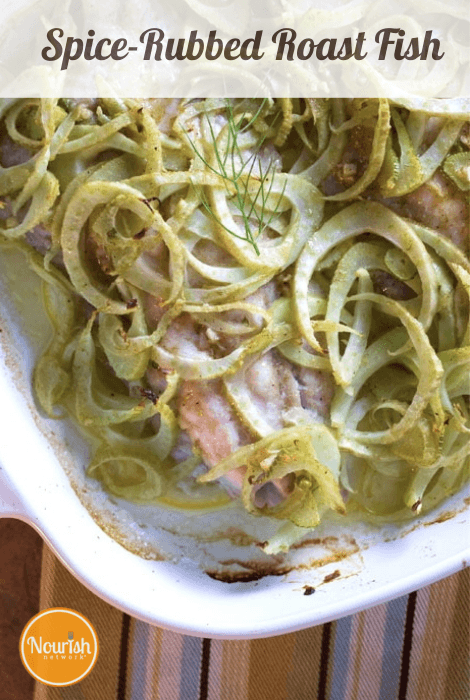 The subtle spice rub and fragrant fennel make this easy roast fish dish something special. 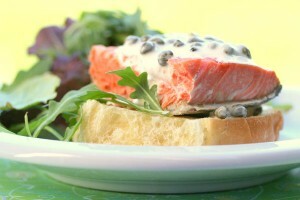 Use any type of medium- to firm-flesh fish, such as sustainably caught cod, haddock or Pacific halibut. What’s sustainable and available varies, depending where you live. That’s why we’re fans of the SeafoodWatch Regional Guides. Cover the bottom of a 9-by-12-inch baking pan with lemon slices. In a small bowl, mix together coriander, cumin, garlic, a pinch of salt and pepper and the olive oil. Rub the fish fillets with half of the spice mixture and arrange fish on top of the lemons. Toss the fennel with the remaining mixture and spread over top of fish. Sprinkle with another small pinch of salt and pepper. Place on rack in center of the oven and roast for 12-15 minutes, until fish flakes easily.